There are a few events in investing that have a high likelihood of being good predictors of the equity market's future direction, like, stock prices follow earnings, market breadth leads price, or an inverted yield curve leads economic weakness. One factor I believe the bears have missed in the recent market advance seems to be their discounting of the increasing strength of corporate earnings growth. 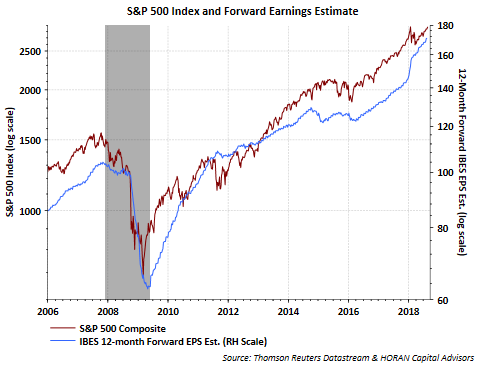 The improved earnings growth picture has not only improved the market's valuation, but as the below chart shows, the faster earnings growth seems to be pulling stocks higher as well. As it relates to breadth and stock prices, Ryan Detrick of LPL Research recently published the below chart. The top portion of the chart is a graph of the S&P 500 Index. The bottom half of the chart is the advance decline line for the New York Stock Exchange Index. The red shaded areas represent times declining issues have exceeded advancing issues. During those times the S&P 500 Index exhibited weakness. 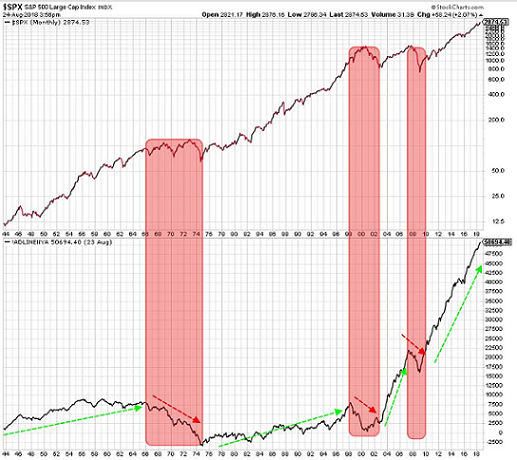 On the other hand, outside of the red shading represent times advancing stocks exceeded declining stocks. During the times the advance decline line was rising, stock prices rose as well. One could then conclude recent positive breadth was a precursor to this week's record high reached in the S&P 500 Index, i.e., breadth leads price. "Every U.S. recession in the past 60 years was preceded by a negative term spread, that is, an inverted yield curve. Furthermore, a negative term spread was always followed by an economic slowdown and, except for one time, by a recession. While the current environment is somewhat special—with low interest rates and risk premiums—the power of the term spread to predict economic slowdowns appears intact." That batting average is not just 25% or 50% of the time, it is 100% of the time that an economic slowdown or recession has occurred after the yield curve inverts. I wrote a blog article in November 2006 after the curve inverted and the author of the Fed article I cited then indicated 'it may be different this time.' That was 2006 and we know what occurred a few years later. Some Fed officials today also believe a yield curve inversion would be different this time around. I highlight yield curve inversions because the current curve is 19 basis points away or .19% from inverting. The comments from Fed Chairman Powell following the Jackson Hole meeting this week seem to indicate the Fed will raise rates in September and possibly again before year end, i.e., two more rate increases in 2018. The Fed has a history of increasing the target Fed Funds rate by 25 basis points or .25% when rate hikes are instituted. As of today, the curve is close to inverting and the rate hike probability for September is over 90%. 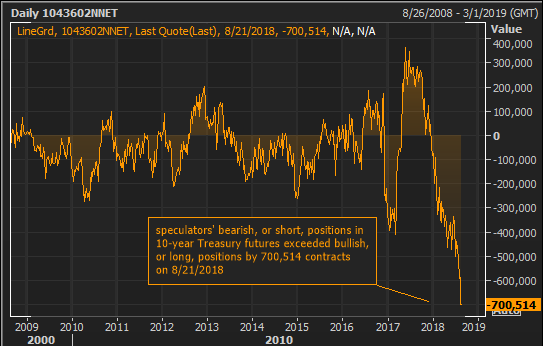 Also at play is the large short position in the 10-year Treasury futures. Short positions exceed long positions by 700,514 contracts as can be seen below. 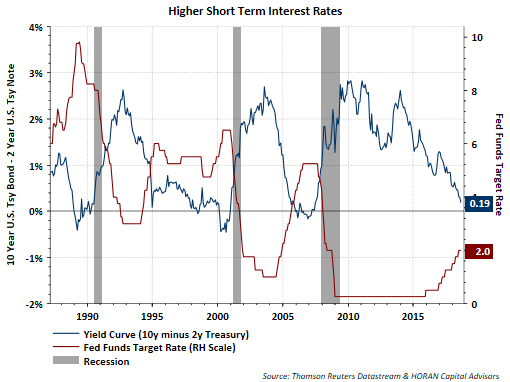 If longer term rates continue to trend lower (higher prices), those investor that are short may feel compelled to cover their short positions. This would result in buying demand in the 10-year Treasury and higher demand means higher Treasury prices. Bond prices move in the opposite direction of yields and this means short covering would result in a lower 10-year Treasury yield, all else being equal. The short covering would then increase the odds of an inverted curve. 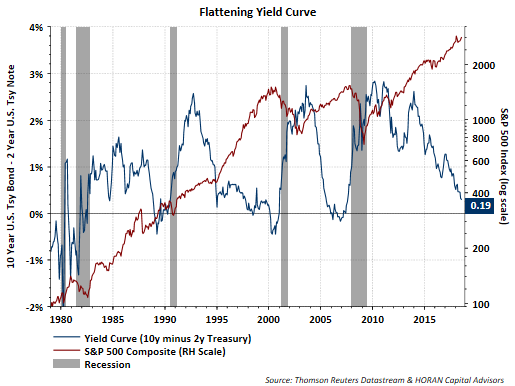 The silver lining in prior yield curve inversions is a recession did not occur immediately. On average it was 19 months before the onset of a recession. Additionally, the average return for the S&P 500 Index from the date of the inversion to the recession was 12.7%. For investors then, one need not panic at the first instance of an inversion; however, thought should be given to one's portfolio allocations and make any necessary adjustments during the ensuing months. In short, respect should be given to the potential economic impact of a yield curve inversion.